Written in 1988, Shakespeare’s tale of King Phycus and his children Juliet and Hamlet is the bard’s first tragedy, a clunky amalgamation of characters and situations that could best be described as a rough draft of the legendary Tragedies that followed. Thought lost for centuries, the play reappeared in the 19th century, but productions were halted for their connections to the Astor Place Riot and the assassination of President Lincoln. Yes, the history of Tom Willmorth’s Shakespeare’s King Phycus is completely fictional, but it is the sort of detail that shows Strange Tree’s commitment to their concept. This isn’t a Monty Python-esque farce (it totally is) – this is Shakespeare’s lost tragedy, and the actors perform it with all the grandeur and importance a forgotten Elizabethan masterpiece deserves. In contrast with the ridiculous content of the play, the actors’ stern execution of their craft enhances the comedy of the piece, whether it is the street battle waged with weaponized fruit or the Nurse’s stream of dead baby retorts. 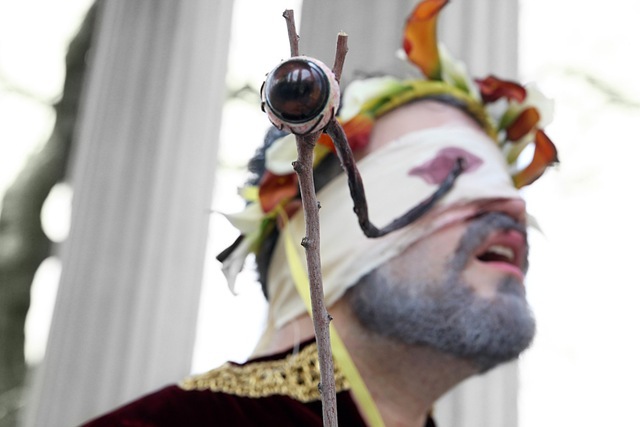 Shakespeare’s King Phycus is at its best when the humor comes from exaggerating the absurdities of Shakespeare’s plots and language. The language of the play, like any rough draft, needs a lot of work. The alliteration is overly aggressive, the rhymes are awkward and many times nonsensical, and wordplay is used so frequently that oftentimes characters lose track of what they’re even talking about. But that’s the point, especially when it comes to the heaps of classic lines that Willmorth butchers with his horrendous poetry, e.g., “By the picking of my nose, something wicked this way goes.” Yuck. Without the work of the talented ensemble, the script would collapse under its own weight, but the actors’ handle on Shakespeare’s language adds integrity to the play. An Elizabethan rendition of “Who’s on first?” is funnier because the actors are on point with the rapid fire banter of broken up iambic pentameter. Conversely, Friar Don’s (Scott Cupper) final monologue is completely unintelligible, showing that this cast doesn’t need consonants and vowels to be funny. With each actor playing multiple roles, Shakespeare’s King Phycus is a demanding show performed admirably as the versatile ensemble transitions between roles seamlessly. Michael T. Downey is noteworthy in the title role, particularly post-eye-gouging, playing the fantastic physical gag so well that the joke never gets old. Bob Kruse’s wonderfully creepy necrophile Gloucester and Carolyn Klein’s vulgar Nurse are also standouts, with both actors taking the exaggerations of the language and matching it with appropriately outrageous physicalizations. As funny as Shakespeare’s King Phycus is, when Willmorth relies too heavily on pop culture references (“Isn’t it Ionic, don’t you think?) and unnecessary fan service (Friar Don is a ninja! ), the results are groan-worthy and take away from the timelessness of the concept. Some of the jokes go on a little too long, like a dance sequence between Brutus, Romeo, and Sardonicus that could use a good minute of cutting, but the production still stands up well despite these flaws. Like the play’s fictional history, the little details are what make Shakespeare’s King Phycus great, the chamber arrangement of “La Cucaracha” playing in the background of the ball, the improv warm-ups of Hamlet’s friends Goldenberg and Rosenstein. 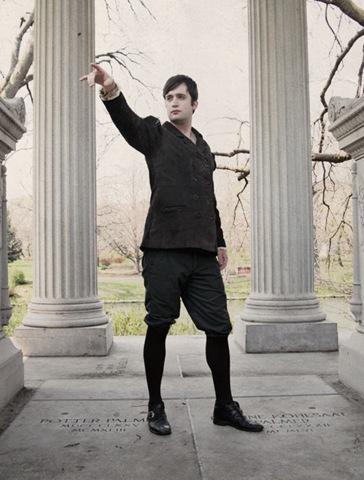 For anyone that loves Shakespeare and wants to see some of his best plays reconstructed then put together in the most haphazardly hilarious way possible, Strangetree’s productions will not disappoint.